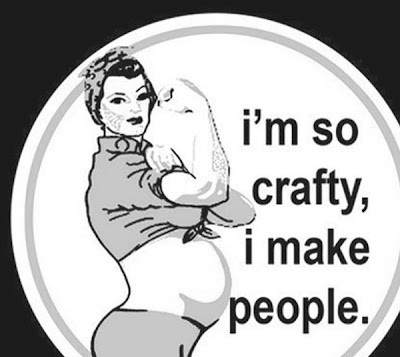 Above graphic from Mutha Crafter. Visit her shop here. We have it ingrained in our heads throughout our entire adult lives-pregnancy is 40 weeks. The "due date" we are given at that first prenatal visit is based upon that 40 weeks, and we look forward to it with great anticipation. When we are still pregnant after that magical date, we call ourselves "overdue" and the days seem to drag on like years. The problem with this belief about the 40 week EDD is that it is not based in fact. It is one of many pregnancy and childbirth myths which has wormed its way into the standard of practice over the years-something that is still believed because "that's the way it's always been done". The 40 week due date is based upon Naegele's Rule. This theory was originated by Harmanni Boerhaave, a botanist who in 1744 came up with a method of calculating the EDD based upon evidence in the Bible that human gestation lasts approximately 10 lunar months. The formula was publicized around 1812 by German obstetrician Franz Naegele and since has become the accepted norm for calculating the due date. There is one glaring flaw in Naegele's rule. Strictly speaking, a lunar (or synodic - from new moon to new moon) month is actually 29.53 days, which makes 10 lunar months roughly 295 days, a full 15 days longer than the 280 days gestation we've been lead to believe is average. In fact, if left alone, 50-80% of mothers will gestate beyond 40 weeks. Aside from the gross miscalculation of the lunar due date, there is another common problem associated with formulating a woman's EDD: most methods of calculating gestational length are based upon a 28 day cycle. 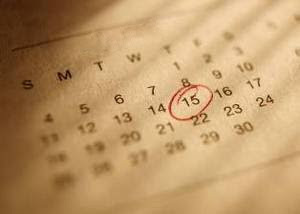 Not all women have a 28 day cycle; some are longer, some are shorter, and even those with a 28 day cycle do not always ovulate right on day 14. If a woman has a cycle which is significantly longer than 28 days and the baby is forced out too soon because her due date is calculated according to her LMP (last menstrual period), this can result in a premature baby with potential health problems at birth. One of the most vital pieces of information to know when you are expecting is that ACOG itself (American College of Obstetricians and Gynecologists) does not recommend interfering with a normal pregnancy before 42 completed weeks. This is why knowing your true conception date and EDD is very important; if you come under pressure from a care provider to deliver at a certain point, you can be armed with ACOG's official recommendations as well as your own exact due date. This can help you and your baby avoid much unnecessary trauma throughout the labor and delivery. Remember, babies can't read calendars; they come on their own time and almost always without complication when left alone to be born when they are truly ready. Misha Safranski is a freelance writer and mother of five, specializing in natural birth, VBAC advocacy, and cesarean prevention issues. See more of her work here. My experience w/ 4 children is that it is not enough to know the ovulation and conception dates. I have a longer cycle and keep close track of those events. Despite this knowledge all the nurse midwives and ob/gyns I have dealt with stubbornly stuck to the EDD found using LMP denying me the extra few days that I could have needed, and harassing me sooner than necessary about being "overdue". One nurse midwife even told me "Unless your husband is a truck driver and was out of town all but one day since your LMP, we are not going to take your word for it". Huh, how would she know I wasn't having an affair? If I ever have a another pregnancy, I will lie about the LMP. Your comment cracks me up... my husband is a truck driver, was only home 1 day in a 6 week time frame, I was not having an affair, and they still insisted their due date was correct. I had 10 months of cycle history and temps/ovulation info too. I just saw this, and love that it was posted the day I gave birth to my last kiddo (a few days "late" of course)! I have had 5 children. My first was "forced" out via c-section because I went a few days past my EDD. I was 19 (almost 20) and was nervous. I took their word. My next two were supposed to be induced but were 2 weeks late (according to EDD) and I started labor on my own the morning before they were each born. My fourth was 3 weeks late. I thankfully went to a birth center and they just let me be. She came out perfect as can be. My fifth was exactly 2 weeks late again. Thankfully I was with the birth center again and they just let me go on my own time. He was born big (11lbs 5oz) but perfect. I think my body just runs late. The boys were all exactly 2 weeks late and if I were left to have my first child when we were both ready I think she would have been 2-3 weeks late. Every woman is different so if we have more kids I know just to tack on a couple of weeks to the due date. It's not just pregnancy due dates that are inaccurate, or at least were. Some fourteen years ago, I visited an old boyfriend in California. Not long after I returned, my period was a bit late, but that's never been so unusual for me. Still, I quickly went for a pregnancy test, following which I made rapid plans for an abortion. The day of my appointment, I had an ultrasound which claimed I had to wait another week for a safe four weeks. I showed the airline ticket stub in my pocket, which proved I could NOT have become pregnant after January 3rd, but the nurse insisted I reschedule. I learned after my second child was 6 days "late" that because I have longer cycles, that date is off by a week. I adjusted my LMP a week and, as it turns out, both of my last two children have been one day early! As a young mother, my Doc. tried to force out my first baby.I was overdue according to her calculation, so she nagged me to go to the hospital to be induced,calling my phone every hour until midnight.But luckily I went into labor after they stuck some gel up there.Ever since then, I promised myself to lie about my LMP at least by ten days just to avoid the hassle.I have seen other women who were induced and because of it, they had to have c-section. funny thing is my mom swears she carried my brother for ten lunar months and 15 days. If you track those things, why not give an LMP based on the date of conception? That's what I did. With my last 2, I just refused to give a LMP date. I told them the date I ovulated (which I knew from charting) and said the LMP was inaccurate bc I was breastfeeding, and I also know my cycles are a little longer. When they insisted on a LMP, I just told them to minus 2 weeks from the ovulation date. Each of my 4 were "overdue" arriving 14, 13, 12 and 15 days beyond the EDD, each time I convinced myself it would be different and they would arrive "on time"!!! Lucky for me I had a great midwife who said just enjoy the pregnancy and the baby will come when they are ready. And they did. I have know many woman who have endured long and arduous labours because of being induced, either because of their anxiety of the EDD or because of their doctors belief in when the baby was due. My first two where two weeks late, according to doc. I had kept track and had my own dates and with both I was way more accurate to when labor started. I got a huge amount of pressure from my health care providers but even my first time around I insisted on not being induced till my date came around. We did stress tests to make them feel better to be sure babies weren't drying out, which seems to be their worry, and no way. I was amazed that they wouldn't listen even when I explained all the signs that I was going to be very soon in labor on my own. I think as more moms are informed more doctors will trust the mother's thoughts on it all. The only thing wrong with this is that 50-80% is a vast range. Seems odd. The other formula at the bottom that says the multipara carries about 40 weeks 3 days..according to my edd I carried my second child exactly 40 weeks and 3 days and I started labor on the 3rd day. With my first I was induced at 41 weeks and 5 days and I will never be induced again if I can at all help it. I hear my friends telling me their doctors are going to induce them because they're 38 and 39 weeks and I like FREAK out and they think I am stupid but it's like really your baby could end up being premature and they're always like no I'm full-term..oh ok cuz I forgot doctors are NEVER wrong..ridiculous! I am so glad I educated myself and I hope to educate other women some day as a midwife..although according to my friends no one would want me to be their midwife because I'd leave them pregnant forever and force them to breastfeed..LMAO. While I think it's VERY important to have this discussion about "due dates", I think it's equally important to remember that there really is a vast range of normal for EVERY thing in life including how long we "cook" our babies. I have friends who have all their babies around 37-38 weeks and that is normal for their family. My family has healthy postdates on both sides. With my MIL possibly having a 46 week pregnancy (she wasn't sure of her LMP), no one was that surprised when I went past 43 weeks. At my 42+2 BPP/NST my OB said I still had a grade 2 placenta... Upon hearing that my midwife exclaimed "You really are going to 46 weeks!" I gave birth to a healthy baby at 43+3 who was covered in vernix and showed no signs of post-maturity. We know exactly when she was conceived and my conception due date, LMP due date and first trimester u/s due date were all within 2 days of each other so she was truly late but worth the wait! Same thing happened to me. My first baby was almost three weeks late, but labour eventually started spontaneously and when he was born he had a perfect APGAR score. It's surprising how keen the midwives are to start pushing for methods of induction. This time around they are doing it BEFORE I have even reached my due date and almost seem surprised that I don't want to meddle with the process. Really they should give a birth "week" ETA so people relax about it a bit more. And guess what? He was born Aug 21st, right on time to my estimation. I seem to ovulate 17 days into my cycle, 3 days later than 'normal' and both my labors started 3 days after my due date, so from my body's standpoint, I think ovulation date is extremely accurate. I feel like I am two weeks farther along then they do at my Drs. Office. According to my period I should have been 9 weeks at my first appt. They measured 7 weeks and 2 days. We will see. They were pretty much right on the money with both of mine. First expected on the 9th, arrived the 6th (but I had no clue when my LMP was, didn't realize I was pregnant til nearly 2 months along). Second was expected the 19th, arrived the evening of the 18th... she was 6wks when I found out I was pregnant again and knew the exact date of conception. EDD should really be taken with a grain of salt. As long as everyone is healthy, why push the issue and induce? I have a question for the author, or anyone who might have an answer. My mom was 4 weeks over due when they induced her and I was born. She and I have no idea how they were calculating her due date, but, I always wondered about what happened because I was born all cracked and dry. Every joint and fold of skin on my body was cracked and bleeding. Mom had to rub me with medicated lotions for the first month of my life. I've tried looking around on Google for the answer, but I'm having a really hard time finding information. Mom said the Doctor told her I was just in there too long. So I'm worried about waiting too long with my baby and doing the same thing to her. Is that possible? Does anyone have any theories? My friend was a week overdue last year when she had her baby, and the Dr decided to induce, because she had low level of amniotic fluid, and the Dr told her that the longer the baby stays in with low amniotic fluid levels, the more dried up and damaged their skin will become, because by the time the baby is born, the protective layer of oily stuff on their skin is mostly gone and their skin is exposed to the fluid. That's what I heard, so, may be that would help answer a part of your question. I was nursing and didnt have a LMP... now what lol? Ha! If they estimated your due date by your LMP then you'd be overdue by a couple of months before you'd even conceived, technically! Has anyone considered that perhaps when babies are born cracked and dry it doesn't have as much to do with the 'due date' but more to do with the fact that mom does not have enough essential oils in her diet while pregnant? Maybe the further she goes into the pregnancy, the more she is depleted of these oils and therefore baby doesn't get enough. I don't know to much on this subject so this is just a hypothesis. How about those of us who conceived through IVF? I know exact day and hour when my baby was conceived, because it happened in the lab. Because I was on hormone stimulation for 2 months prior, I can not use LMP at all for due date calculation, but my OB insisted to use that, even when I told her the specific day of conception. She did use the due date that IVF clinic gave me, but shaved off a day from it to make it a day early. I decided to not induce until at least 42 weeks if it comes to that, unless there's something wrong with placenta or baby. Same exact thing happened to me! My estimated due date is supposed to be (according to one OB) November 17th now (according to the midwifes im using) its November 18th...But i have a feeling he wants to come out cuz hes kicking for hours at a time like hes trying to say Get me out of here....Hes dropped very low i hope its almost time for me!! I hope I go before thanksgiving...Im giving him up for adoption to a wonderful couple and i want their family to meet him by thanksgiving...I just have a feeling that I will be going into labor any day now...Is that possible to be able to tell a few days before you go into labor? What are the laws for each state regarding rights of the mother and child past 42 weeks? My chiropractor was telling me that she went 42 weeks and 5 days and was forced to be induced which ended in a c-section :-( if she had not agreed to being induced she would of been alone, dropped by her midwife and OB, nothing was wrong with her baby according to the ultra sound and heart beat, but legally she had to be induced. So what rights, if any do we have? Are we to stand for being forced into something that is not natural, being induced which many times ends in failure to progress and c-section! Do you have any resources on this? This is really interesting! With my second I was insisting on a VBAC and went to 42 weeks and 2 days. I really had to fight the inductions (I cancelled two!) and made my doctor angry, especially because they said I had gestational diabetes (really, I just failed the glucose by 7 points, then went on to test 4 times a day and NEVER had a high blood sugar reading, then gave birth 16 days past the EDD to a 7 lbs baby, so I didn't REALLY have gestational diabetes but they were flipped out). My cycle has never been long or short though, like clockwork, 28 days. Still, I think when a baby is ready, it will come! No one stays pregnant forever, baby and body knows best. Unfortunately I still was doomed for a c-section, after 34 hours of hard, natural labor, the baby hadn't dropped even a half inch and I never dilated more than 1cm. Same thing with my first (an 18 hour labor). My babies never budge even a smidge into the birth canal. So, it's c-sections for me. Still, I hate when doctors don't give the woman's body enough credit. It is important to note that the Mittendorf study was based on the dates of ONLY 30 first-time mothers. There are much better studies out there that look at averages in larger groups of women. It is really unfortunate that such a small study has been given so much credit that everyone in the childbirth world (my midwife included!) thinks that the average length of pregnancy for a first time mother is 40 weeks 8 days. Look at more studies with more data. The average is 40 weeks, people, and that's why they give you an estimated due date of 40 weeks! im due July 25 ( 2.5 weeks ! ) per the LMP my OBGYN gave me in the beginning. but using the LMP-3months+ 10 days since this is my second pregnancy i would be due around July 11 ( 5 days from now ?@!). my due date was calculated originally in the office by ultrasound due to surgery that same month and having had irregular periods before that. I have 11 children, all birthed naturally with no inductions, and my overall average is 40 weeks 3 days - exactly as the article states. Hi, I am a week past my EDD and don't want to be induced cause the doctor says so. Someone please tell me what tests to request for to disapprove induction. This is my first baby. Just politely tell them you refuse to be induced until a fetal nonstress test deems otherwise. Hi. I'm in the UK so not sure the difference in tests (I presume you're probably in the States? ).....but I went 2 weeks over my EDD. I refused to be induced, and so after 12 days overdue the maternity department requested that I have a scan to ensure that the placenta and cord were still functioning normally (sometimes if the baby is very overdue I was told that the placenta may stop working at 'full speed' and so it's good to make sure that the blood is still pumping to the baby ok and everything is still working well). I felt it was a good compromise....they said that as long as it was all okay on the scan, they wouldn't push to induce me. And I felt that if I knew it was all okay too, I'd be happy to go past 42 weeks and just let little Sprout come out when it was ready....obviously it was all okay, and she was delivered at exactly 42 weeks 6 months today! I know how nervous it can make you when it's your first (it was mine too).....BUT.....it is SO important to let the baby come out when it's ready. Medical people have to follow these silly rules to cover themselves, but it is YOUR decision, not theirs.....don't let anyone bully you into being induced...it is a very unnatural way to begin and very natural journey! Even then - if baby is *seriously* in need of being born immediately (i.e. there are risks that warrant immediate birth), then induction with artificial hormones will only be more strenuous on baby than surgical birth. We push induction across the board, but rarely is it actually justified - and in cases where it is (mom or baby's lives are in danger if pregnancy continues) then surgical birth is justified, not increased stress to the body/baby with pit and the like. This is one reason we see such high morbidity and mortality in the U.S. vs. other developed nations. Just wanted to chime in to say that I stopped going when they started pushing induction (I did change providers to a midwifery team that wouldn't put such pressures on me - and told the OB office I was switching). I still birthed in the same location, I just had the midwives transfer me back to the hospital where I had originally planned to birth anyway. Took away the stress of the situation and being pestered at each visit. My babies were born at 44 and at 42 weeks. Don't listen to the threats and nonsense they will feed you --- your body KNOWS what it is doing, and babies know when they are ready to be born. Remember: 42 weeks is the average gestational length for first time moms -- some birth babies later, some earlier - but 42 is average (not 40 and not 41). This is your first baby so there is no telling what your body's normal is. You can change doctors at any time and refuse to go in for an induction. It's your body and your choice. Also ask some of your older relatives how long they carried. I'm at 41 weeks with 5 days but confused because my first born and second born I give birth at 40 weeks only. We also know that slightly different gestational lengths run in families. You may grow a baby faster (literally), while the next woman (and her mother, her grandmother) grow babies slower. This time varies, and is usually between 38-43 weeks, but for some maternal lines it is typically prior to or right at 40 weeks, and for others it is well after - and both can be healthy. Unless you know your date of conception without a doubt, there is also commonly errors in ultrasound estimation - even in the early weeks, which can cause things to be slightly off in dating. So if my last period was Sept 14 and I subtract 3 months and 10 days then what sorry I'm confused Lol help???? I am due March 3 with my first baby. My Dr. Insists he is going to be too big for me to deliver vaginally, though she never measured me nor is there a test that exists besides a prior delivery to tell what our bodies are capable of doing during labor. She wants me to get a c section on the 27th of Feb, but I want to try a natural delivery. Can I refuse? I don't want her to be an angry bit** should I need a section after all, but I don't feel she is right to insist I need one! ?